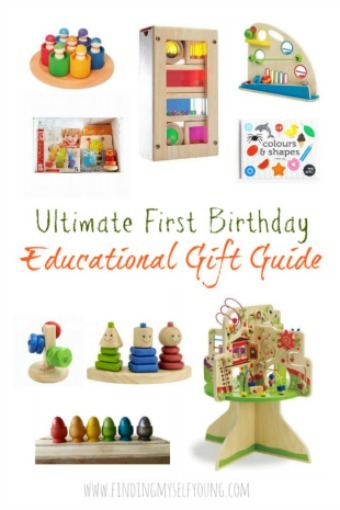 So its been almost two weeks since the huge first birthday party and Im finally getting around to writing about it. I think my body's only just getting used to the fact that I don't need to stay up til almost midnight each night making party supplies. As much as I love washi tape, I am glad I'm no longer cutting copious amounts of tape into flag shapes. First birthday parties are meant to be big right? At least for the first kid. It would've been sooo much easier (and probably cheaper) if I had've gone out and bought all the items instead of making stuff, but I wanted it to be special. I wanted her to have a party that was unique. I wanted to weave my blood, sweat and tears love into as many parts of the party as I could. Turns out, despite the late nights, I actually relished the process of making all the elements that I did. I seem to have unlocked a creative side to myself that I didn't know existed. 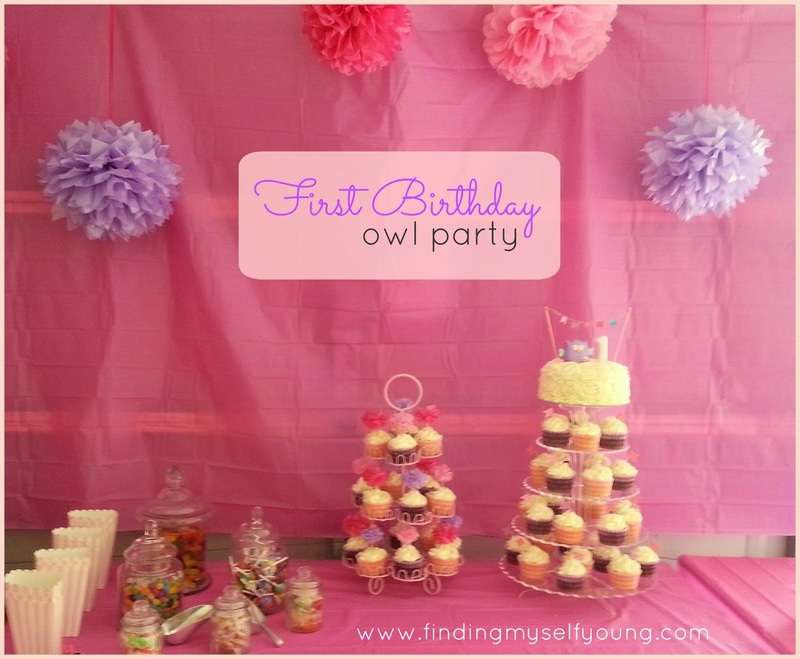 I didn't go all matchy matchy with the decorations, but I had a colour theme of pink, purple and a hint of blue (and of course owls were woven in wherever I could put them without it being too overwhelming). 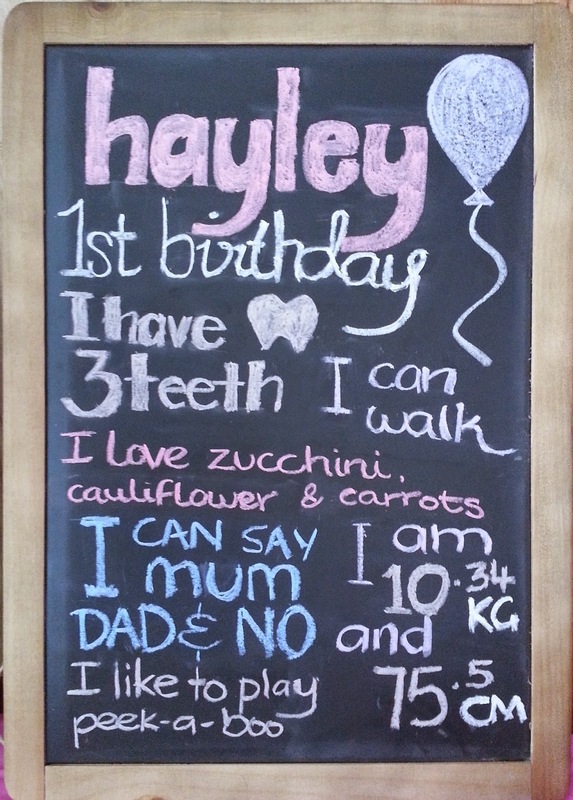 One thing I really wanted to do was a birthday chalkboard sign. For those who have no idea what the hell I'm talking about, its a blackboard with various statements about the birthday girl. I got the idea initially from Pinterest (of course). You can get these done up by professionals so they actually look decent and there are some cheat versions you can get from etsy that are just prints that look like chalkboards, but of course I thought I'd give it a crack myself. I bought a blackboard on sale from Typo for $19.99 and already had some coloured chalk lying around. I have to say I underestimated the amount of effort involved in this project and way overestimated my skills (aka writing with chalk). The sign ended up taking me over 2 hours all up to complete and I'm glad the board came with a duster because there was a lot of erasing going on. In the end I still ended up writing all crooked, but I think it still looked kind of ok. At least that's what people were telling me (they could've been lying). 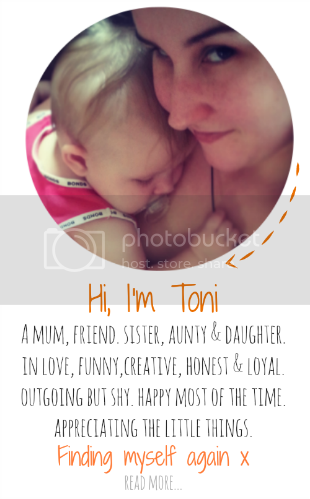 I wanted to make a cute photo board showing how shes changed in the last twelve months. There are various different versions of these on Pinterest. I made mine using an old corkboard I've had since my uni days thats been sitting unused in the spare room for ages (I knew it'd come in handy one day). In order to fit quite a few photos on my corkboard I used my instagram photos and got them printed in mini squares from Printstagram online. To assemble the photoboard I used twine and mini pegs from a local junk shop and found the cutest little camera pins from Typo. There was no way I was going to attempt to make the birthday cake myself. Apart from the fact that I don't bake very often, her cake had to be modified a lot because of her allergies and I didn't want it to taste like cardboard so I outsourced it. I baked cupcakes a few weeks before the party to eliminate other allergies and during that time discovered shes also allergic to eggs so the cake had to be modified further. 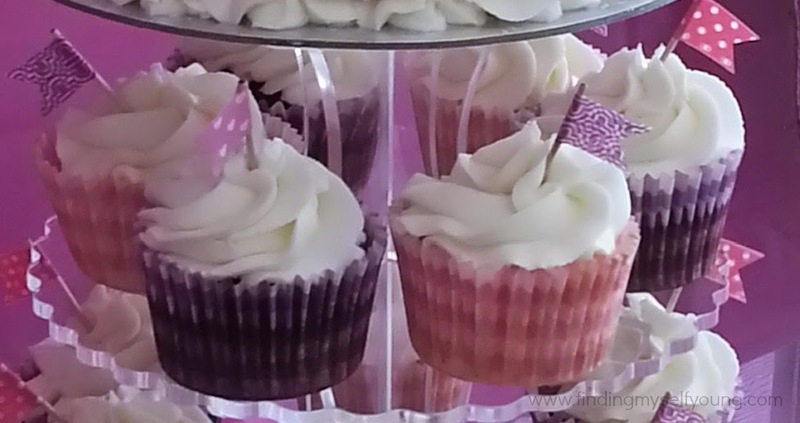 I got a small cake so I could put a banner on top and then cupcakes, half chocolate and half vanilla. The chocolate ones were normal ingredients and the vanilla were dairy, soy and egg free so she could eat some cake like the other kids. 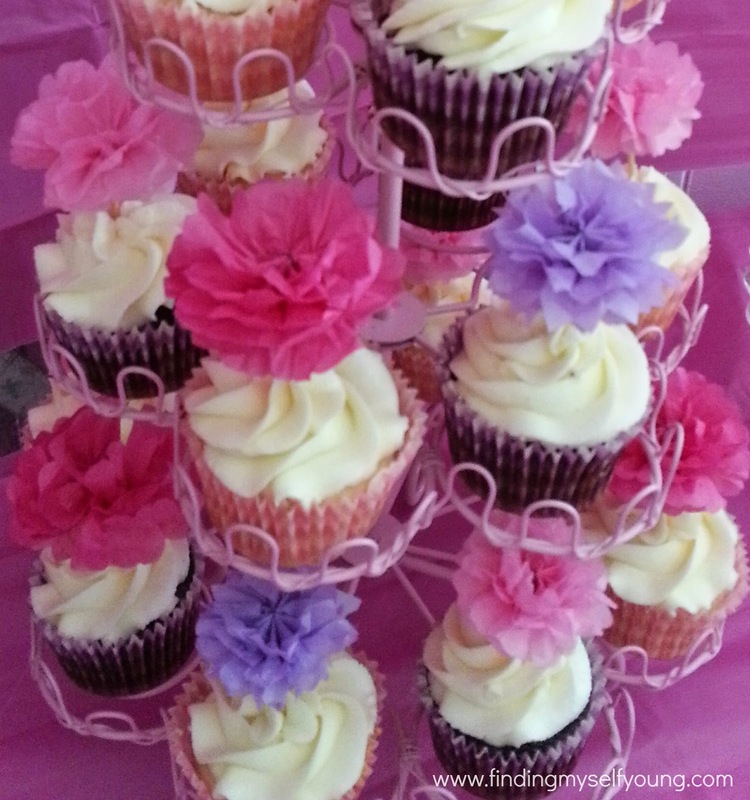 The cake and cupcakes were made by Nina from Sticky Fingers Cakes and Cupcakes and she did an amazing job. They tasted divine! I ate nearly all of the top cake myself over the week following the party (and I don't regret it at all). 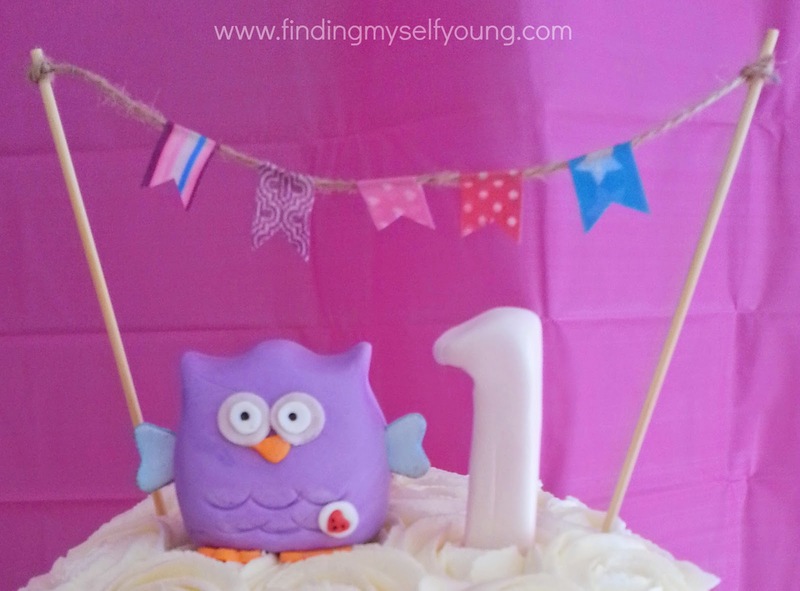 Nina also made the owl on top of the cake which matched the owl on the party invitations. I was blown away by the detail she was able to put into it. I wouldn't have the patience to work with something that tiny, but I'm glad she did. If my obsession with washi tape wasn't already obvious, it is now. I made the washi tape bunting for the main cake and also made matching flags for the cupcakes underneath. Yes I was all ocd and measured out the tape as I was doing it. T thought that was pointless, but found it quite amusing watching me doing it. I also got some other awesome decorations handmade by Nicky from Fancy Pants Party Stylists. 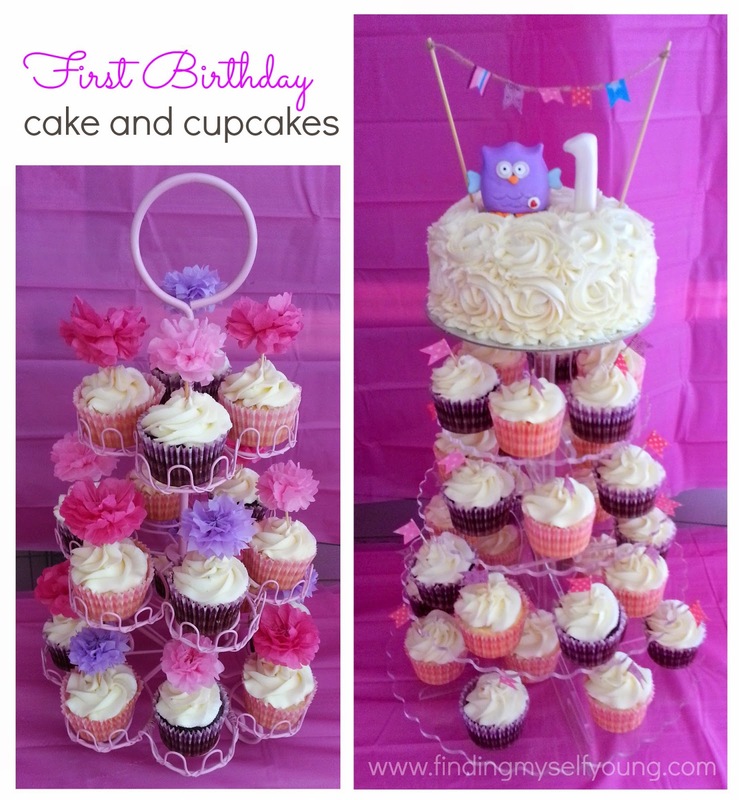 She put together some gorgeous tissue paper pom poms and pom pom cake toppers to match the pink and purple colour scheme. Each pom pom was put together from scratch using tissue paper, florist wire and ribbon so they're all unique. 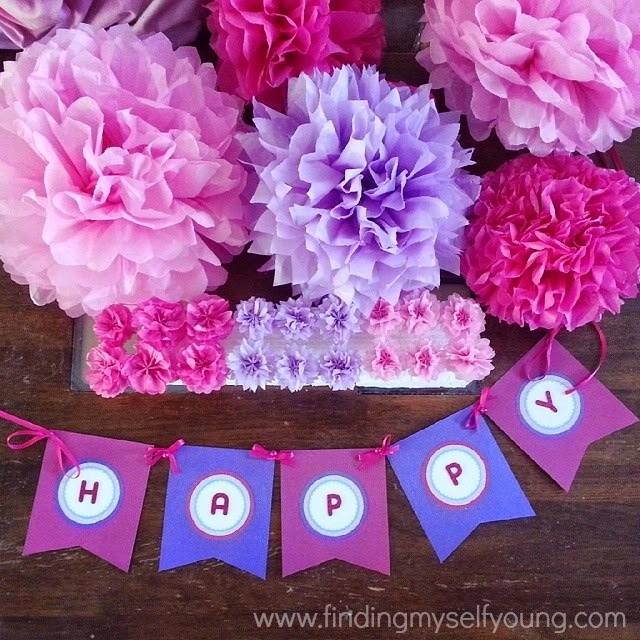 She also designed a beautiful happy birthday bunting which she handmade from cardboard and ribbon. I had a lolly buffet moreso for the adults so they had something to take home as the kids party bags didn't have any lollies in them. Of course once the older kids saw lollies they had to have some. Even after they devoured as much as they could and the parents took some home there were still lollies left over, so unfortunately we had to take them home and eat them. Poor us! Being the party host is a tough gig. 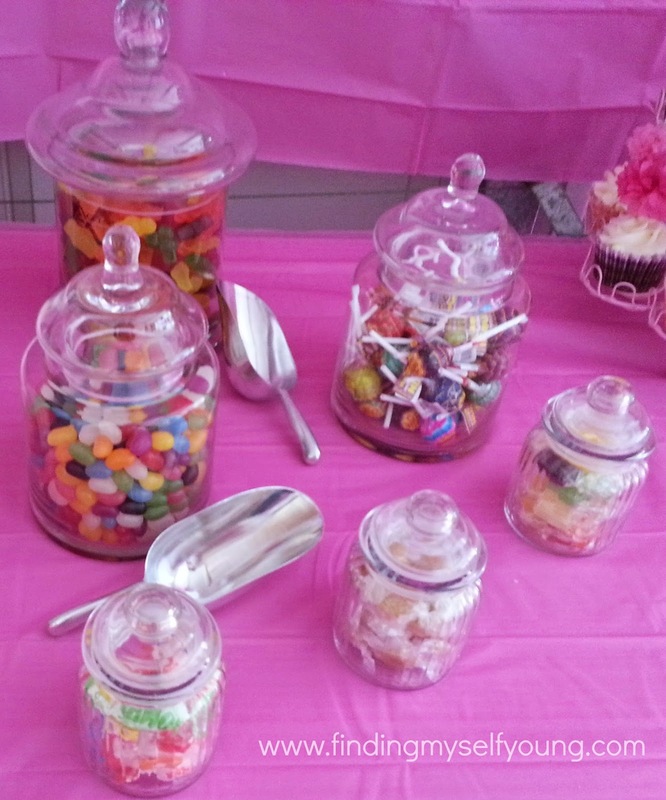 There's still some sitting on my kitchen bench, I clearly overestimated the amount of lollies required! Seems the best part of a party these days is the goodie bags, at least for the kids. I made the goodie bags myself over the course of many late nights. I used washi tape to make a banner across the top of the bags the same as the one on top of her cake so it all tied together. You can read exactly how I made them here. I was really happy with the way they ended up turning out. Of course in the midst of all the party fun I forgot to take photos of the food and presents and the ball pit and inflatable cubby etc etc. I still have no idea how we fit everything into my mums place. If we end up doing a big party again next year we'll definitely need to do it in a park so there's enough room. Hopefully all the kids still had a good time. Hayley seemed to have a good time, even though she slept for an hour of the party. 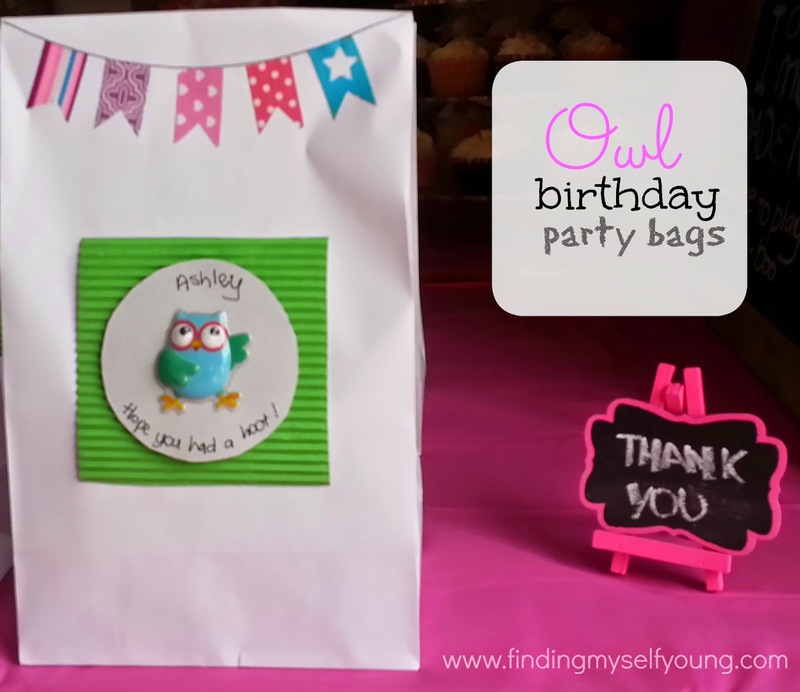 Have you ever done a huge birthday party for your kids? Did you make everything yourself or buy it all? Yep it was heaps of fun! Absolutely beautiful! Next time you'll have to designate a few photographs to capture your amazing work. Well done mumma! Wonderful memories for your family. Yea I really should've handed over the photographing duties in a more organised fashion. Haha I wasn't referring to you specifically, but thanks! The vanilla ones were delicious hey you couldn't even tell the difference which is great because I don't want her to feel like shes missing out later on. It's scary how excited I just got looking at all these photos!!! I love a good birthday party and this one looks amazing. What an incredible job you did with everything... the food.. the lolly bags... the lolly buffet.. the photos... the chalkboard!! Everything!!! I absolutely love it all. Its scary how excited I still get looking at these photos and its already happened and Im still excited about it. My goodness that cake is fabulous, nice to have photos to show her what a big effort you make for her 1st. Well done, you did a gorgeous job. Yea its just a pity she wont actually remember it (but I will lol). That looks amazing Toni!!! You have done such an amazing job. 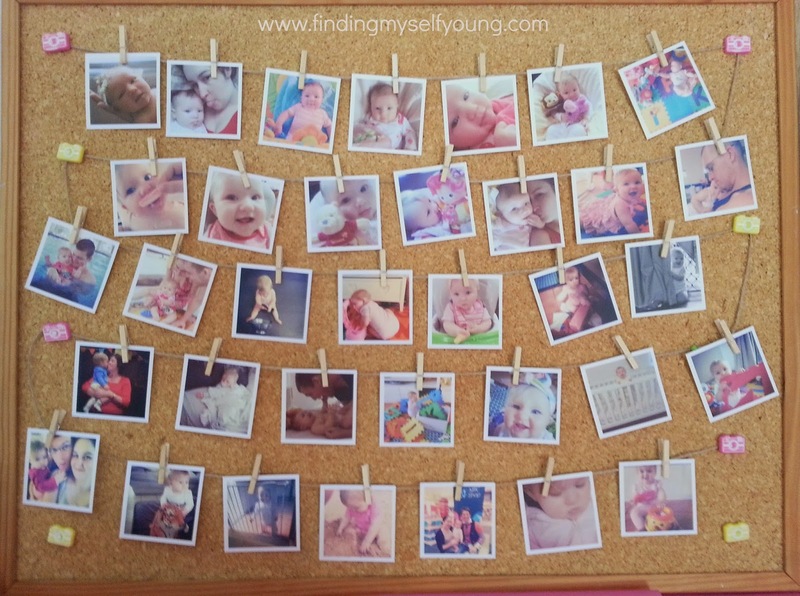 Your little one will be able to look back on these photos when she is older and be in awe of how much effort you put in! You did a great job and everything came together beautifully. Washi Tape is unbelievable stuff, isn't it! Oh god washi tape is awesome! Nice work Toni!! It all looks amazing. I have never had a party for any of my kids!! Total slacker!! I am so glad we never arranged anything for last week with bub being sick. Turns out we don't really have a spare weekend anyway for about 3 weeks!! Thanks for linking up!! One of the boys in our mums group was really sick on his birthday too (they didnt have a party planned either). I felt so bad for him. I would've been so devastated if she got sick. It was so good Sonia omg I can still taste it. Visting from mums take five, and this party is amazing! Good job! 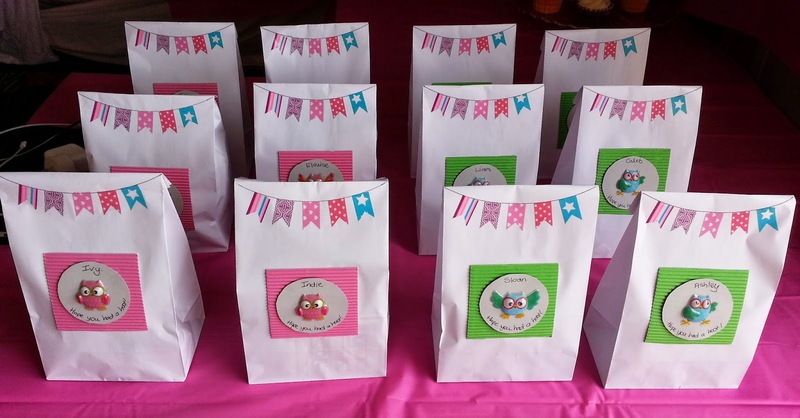 I love the little goodie bags they are so cute! They were so much fun to make. Everything here looks so amazing! You are an awesome mom for putting this altogether! We have never been huge on birthday parties. I make cake and usually keep it a family event. 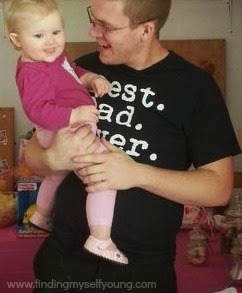 What an amazing 1st birthday party! I love all the little bit and I know how long that take. You did a great job, everything looks fantastic.